This line is open except through Cowdenbeath, where the newer loop line is in use and the original route has been converted into a footpath, and the original terminus at Dunfermline Upper. This line runs through an area of former coalmines and countryside. This was the western terminus of this line The line was extended west by the Stirling and Dunfermline Railway to Alloa and Stirling. This station consisted of two platforms, a through track behind the eastbound platforms, a two road goods shed and some loading banks at the east end of the station. The westbound platform building was built in stone with an extensive canopy with wooden ends and a glass roof. The eastbound platform buildings were built in timber, both with timber canopies. The left view looks west. At the time the station buildings were about to be demolished; two men can be seen on the roof of the goods shed removing the slate roof. The sleeper indentations from the recently-lifted line to Comrie Colliery can be seen in the foreground. This was a west facing junction with the Dunfermline and Queensferry Railway which ran south to connect with the Forth Bridge Railway and on to Edinburgh. This was the site of Townhill Junction, an east facing junction with the Dunfermline and Queensferry Railway which ran south to connect with the Forth Bridge Railway and on to Edinburgh. To the east there was access to Townhill Yard. The site of the junction has now been cleared and is occupied by the new Dunfermline Queen Margaret station. Townhill yard viewed from Halbeath level crossing at its east end. The yard is now mostly lifted. To the south were the Dunfermline Townhill Workshops where wagons were repaired and also diesel locomotives repaired. 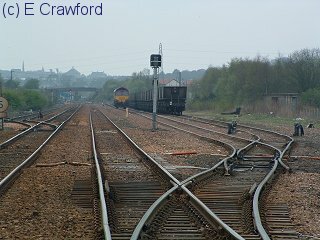 The remaining sidings are often used by coal trains (see photograph). When these run to Longannet they need to halt at Townhill for the locomotive to round the train before running south again to Dunfermline and the Kincardine Line. 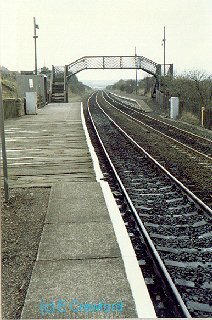 This was a two platform station to the east of Townhill Yard and the west of the Halbeath Railway. The station building still stands by a level crossing. Halbeath Railway and Kelty & Saline branch. To the north of Lochgelly station was the Lochgelly Iron works which had a tram road running south to coal mines. The station remains open and has two platforms. This station has two staggered platforms. This was the terminus for sevices from Edinburgh for a number of years until until the Cardenden to Thornton South Junction re-opened to passengers allowing the 'Fife Circle' to come into operation. This Marshalling Yard was constructed during the 1950s in connection with the nearby Rothes Pit. The Yard is on the North side of the main line. The yard was fitted with radio control trains movements and automatic retarders. Sadly the Rothes Pit was a failure and the Yard has never been used to capacity, frequently being used to hold surplus wagons and rolling stock. Many of the sidings have been lifted. There was a connecting line from here to Kelty North Junction via Westfield. The section to Westfield remains open for coal slurry traffic. This pit (located immediately to the east of Thornton Marshalling Yard), opened in 1957, was a failure due to less intact coal being present than expected. The mine closed in the 1960s but the surface buildings remained standing, the winding towers being demolished in 1993. This is a two platform station on a section of double track. But things are not as they appear. The north platform is on a single track section from Thornton West Junction to Thornton North Junction. The south platform is on a single track section from Thornton West Junction to Thornton South Junction. The tracks run parallel and appear to be a normal double track. Thornton West Junction is just west of the station.